PPL Electric Utilities is installing lightning arresters to help prevent power outages caused by lightning. Lightning strikes somewhere in the PPL Electric Utilities service territory nearly half a million times each year, according to data obtained through the National Lightning Detection Network. It’s powerful stuff. Each 300-million-volt bolt can heat the air around it to 50,000 degrees — about five times as hot as the sun. And when a bolt strikes near electrical equipment, it can damage poles and transformers, trip circuit breakers and splinter trees and limbs, sending them flying into power lines. Thankfully, the power lines and related equipment that deliver your power don’t get hit every time lightning appears in the sky. Depending on how active a storm season is, lightning can hit our transmission lines or related equipment hundreds of times in any given year. That can potentially hurt service to customers. We’re working on several fronts to reduce the effects of all these atmospheric fireworks on the transmission power lines that deliver electricity used by about 3 million people in central and eastern Pennsylvania. Adding a second overhead shield wire on all new and rebuilt transmission lines to help intercept more lightning strikes and prevent lightning-related outages. Improving how we ground our transmission poles to reduce the effects of lightning. 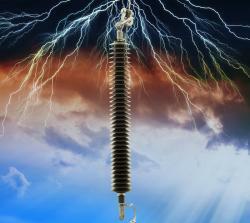 Using lightning arresters on transmission lines that are most susceptible to lightning outages. These act like surge protectors. Using state-of-the-art software to help make sure new transmission lines are designed for optimal performance. Lower-voltage distribution lines, those typically seen along local residential streets, also are equipped with lightning protection. Lightning arresters on these lines and related equipment are much smaller than their transmission cousins, but the concept is the same. And there are many more of these arresters on the distribution system. They are located on all devices on the system, such as transformers you might see on a pole. Underground lines, like those common in many suburban developments, also have lightning protection. There are many more miles of distribution lines than transmission, so on average they are affected more often. Lightning protection systems assure for highly reliable, resilient, and functioning equipment during and after severe thunder and lightning storms. The utility has stepped up its efforts to reduce the impact of lightning and other meteorological mayhem.